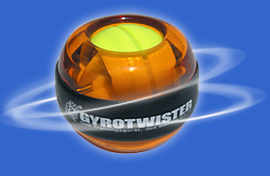 Who can use the GyroTwister? The GyroTwister can be used by people of all ages. Everyone can benefit from the completely positive training effects (grip strengthening, wrists, upper and lower arms, improved circulation and coordination skills). With its ability to strengthen arms from your fingertips to shoulders, the GyroTwister is suitable not only for indoor climbers, mountain climbers, bowlers, and players of tennis, squash, baseball, basketball and golf. It's also perfect for musicians including drummers, piano and guitar players. Many professional motorcyclists and cyclists experience hand problems arising from keeping hands in the same position for too long. The GyroTwister can help prevent these kinds of problems. MenPeople who sit in front of the computer daily, or who perform repetitive tasks with their hands, should use the GyroTwister once and a while to relax their muscles (1-2 minutes is enough). This releases tension, improve circulation and can help prevent over-straining and inflammation of muscles, nerves and tendons such as Carpal Tunnel Syndrome or RSI (Repetitive Strain Injury). The GyroTwister can improve coordination skills and help prevent muscle deterioration. It's a perfect aid in rehabilitation (e.g. after breaking bones - please consult your physician before use). Additionally, elderly persons especially can benefit from the positive effects of the GyroTwister : it helps maintain movement and coordination skills later in life. Given it's small size, the GyroTwister can be taken anywhere. Use it while reading, watching TV, eating, walking, during short relaxation breaks during work or for many other occasions.